Pfc. Takeo L. Kingi introduces members of his family at a presentation ceremony for the French Legion of Honor medal on Thursday in Hawthorne. He is joined by (from right) Pfc. David Lester, Tech Sgt. Paul Pietsch, Jr. and Tech Sgt. Rudy Acosta. HAWTHORNE — Pfc. Takeo L. Kingi and Pfc. 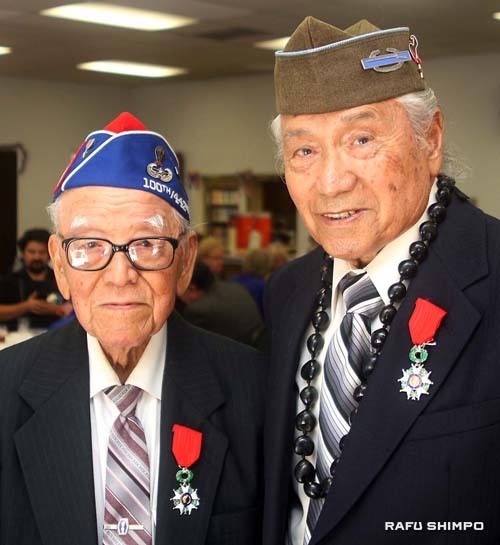 Seiji Oshiro of the 442nd Regimental Combat Team were awarded the French Legion of Honor medal during a ceremony on June 27 at Trinity Lutheran Church in Hawthorne. French Consul General Axel Cruau embraces Pfc. Seiji Oshiro. Axel Cruau, consul general of France in Los Angeles, bestowed the medals on the men in gratitude for their heroism during World War II. Also receiving the honor at the ceremony were Tech Sgt. Rudy Acosta, Pfc. David W. Lester and Pvt. John “Russell” Hunter. “Your accomplishments during the Second World War are a violent reminder of a friendship between France and the U.S., a friendship bound in love and hardships,” said Cruau. The French and American national anthems were performed by Fran Sanders and an invocation was given by Rev. Lawrence D. Becker, senior pastor of Trinity Lutheran Church. 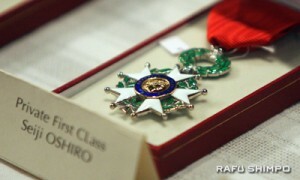 The Legion of Honor is France’s highest award and is conferred upon men and women, either French citizens or foreign nationals, for outstanding achievements in military or civilian life. Kingi was born in Pensacola, Fla., in January 1925. His Japan-born father had a distinguished 30-year career with the U.S. Navy, including World War I. The Kingi family moved to Los Angeles in 1928. Because of his father’s honorable service, the entire Kingi family was the only family exempted from the evacuation order, but they suffered significant intolerance because of their Japanese ancestry. Kingi voluntarily enlisted in the U.S. Army in June 1944 and after basic training, he was assigned as a rifleman to Company C of the 100th Infantry Battalion. He arrived in Southern France in January 1945 and his unit operated in rough Maritime Alps terrain guarding the Franco-Italian border against German force incursions. The French Legion of Honor. 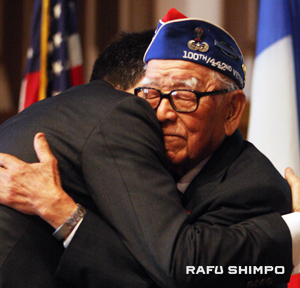 Oshiro was born in the Waipio Valley, Hawaii in June 1923 to Issei immigrants. He recalls the Japanese attack on Pearl Harbor on Dec. 7, 1941, which forced his family to relocate inland away from strategic locations. In March 1943, Oshiro volunteered to serve in the 442nd RCT and received several weeks of training at Camp Shelby in Mississippi before being sent to Europe. As a member of the Anti-Tank Company, he was trained to use a bazooka to destroy enemy tanks. His campaigns include Rome-Arno, North Apennines, Po Valley, Rhineland and Southern France. He landed in Southern France in August 1944 in a glider assault in which he sustained injuries. His decorations include the Bronze Star with one Oak Leaf Cluster, Purple Heart, Combat Infantryman Badge, and the EAME Campaign Medal with one silver star and arrowhead. He lives in Huntington Beach with his wife, Evelyn. 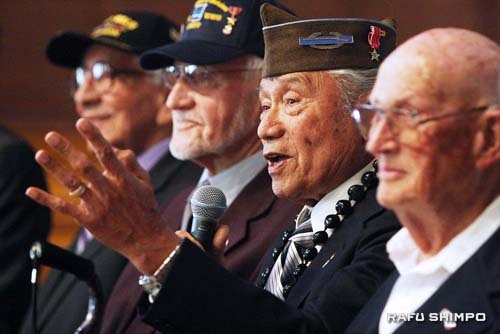 442nd RCT veterans Seiji Oshiro and Takeo Kingi with their medals.